The Obama administration has been playing ping pong with the Keystone Pipeline to bring tar sand oil from Alberta Canada to the US gulf coast for refining. The ping pong is not diplomacy like that of the Nixon era with China. It is simply the passing of the buck in decision making whether the pipeline goes ahead or not. The State Department is key to the decision but the President of the USA must make the final decision. His energy policy so far has been a flop to put it mildly. While he may claim he single handedly brought shale oil and gas to market, he and Chu and now Moniz are tainted with flops left, right, and center in the energy arena. Yesterday the state department determined that the amount of CO2 going into the global atmosphere will be the same whether the pipeline is built of not. That is, they know the Chinese will take the tar sand oil if we do not. Actually if the Chinese take the tar sand oil the CO2 emissions will be higher than if the Keystone Pipeline is built. The reason being is that the refineries on the gulf coast are in place and the hydrogen supply needed to treat the heavy crude is already in place on the gulf. Hydrogen on the gulf is produced by reforming of natural gas which the US has more than ample supply of natural gas based on the shale bonanza that Obama et al. had nothing to do with. China is short of natural gas and would either have to produce hydrogen from imported LNG or from coal. Both of these alternates have far higher carbon footprints than the hydrogen from natural gas in the US gulf. Viola the Keystone Pipeline makes ecologic sense on this basis. From an economics perspective even Obama the deer in the headlights of the first debate gets the arithmetic that jobs and GDP will be created by value adding to the heavy tar sand crude oil in the USA. The New York Times put their slant on yesterday’s news that the State Department has found no worsening of global CO2 emissions if Keystone gets built. The real question for Mr. Obama is whether he wants to be remembered for being a Keystone Cop type President or a President whose only tangible accomplishments in the energy arena was to have funded Solyndra, A 123, Ener 1, Fisker, and all the other bust companies Leslie Stahl listed in her Sixty Minutes piece that outed cleantech. I just hope that the President does not turn to Al Gore for advice on how to make the decision on the pipeline. 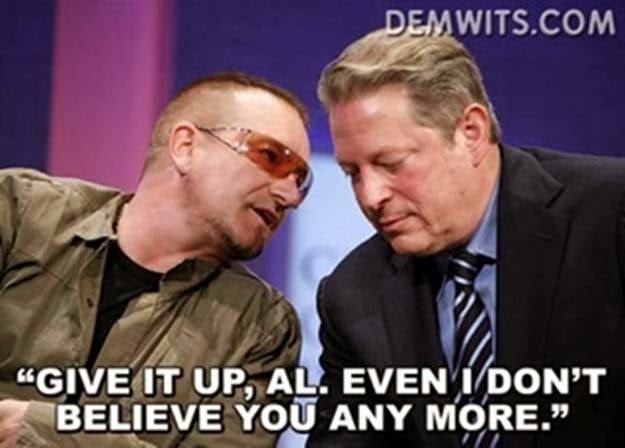 Mr. President even Bono does not believe Al Gore any more. 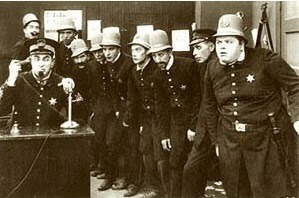 Al Gore resembles the Keystone Cop on the very right of the photo. His Presidential Library is at stake. I think he is a smart man and will finally use Insight not Politics. He can't stand for a 3 rd term, so he can kiss voter sentiment goodbye.